What does it mean to serve justice? What all those intelligence agencies can achieve by catching the little fish in a big ocean? Molly Bloom was not a little fish neither a shark. But she was someone who stood between small and big pockets, have them seated in one table for one big game – poker. And that’s her story in Aaron Sorkin’s ‘Molly’s Game’. Jessica Chastain as Molly, Idris Elba as her attorney and Kevin Costner as her father, ‘Molly’s Game’ follows a young woman, who was back in the day a promising Olympic athlete, but now a person who has been arrested by seventeen FBI agents, who like calm and well-behaved students called her phone first to inform they were all standing outside to arrest her. All what she needed was to get up, go out and voluntarily give up. So she does, to take us back, to introduce us to her unique persona and tell the story of how everything began up until the moment when she found herself accused with all those heavy charges. Aaron Sorkin’s drama offers an enjoyable ride into the world of poker I personally know nothing about. Molly’s strong will, determination and intelligence allows her to lead an underground world of games, that eventually drew a lot of attention. 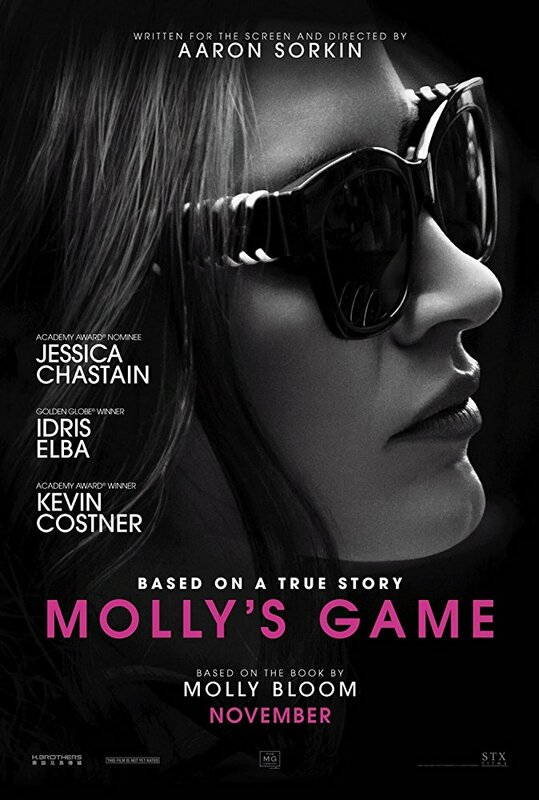 Jessica Chastain’s gorgeous performance secures ‘Molly’s Game’ as the year’s most intriguing production so far and can be considered as a high crime committed by anyone who decides to miss the film under any circumstances. And that was not a joke, not at all.